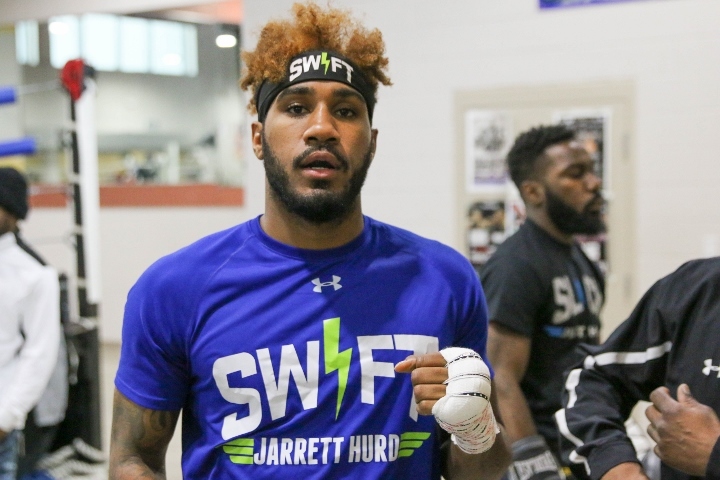 In less than two months, Jarrett Hurd will get to relive the feeling of fighting in front of his adoring local fans for his May 11 homecoming versus Julian Williams. He’ll get his first taste on Sunday night, just not inside the ring. The unbeaten, unified super welterweight titlist will join the broadcast team for this Sunday’s PBC on FS1 card live from the MGM National Harbor Resort in Oxon Hill, Md. Hurd—who hails from nearby Accokeek, Md.—will serve as an expert analyst for the televised tripleheader. Topping the bill is Washington’s D.C.’s own Lamont Peterson in a 12-round bout versus Sergey Lipinets in a welterweight crossroads matchup of former 140-pound titlists. The venue is perfectly situated between Hurd’s hometown and the site of his next fight, as his PBC on Fox headliner versus Williams will take place at EagleBank Arena on George Mason University campus in Fairfax, VA. For the next two months, Hurd gets to train, commentate and fight all without having to stray more than 40 miles from home. “It’s a luxury to be able to train at home, since we’re usually going away for training camps,” notes Hurd, whose first 13 pro bouts all took place in the greater D.C. area but none since Nov. ’14. “We’re going about it the same, 12 rounds prepared. Hurd’s ringside appearance breaks a recent FS1 trend where PBC brass have installed a boxer relevant to the weight division of the main event. Two-time super middleweight titlist Anthony Dirrell served as the expert analyst for the first PBC on FS1 show since the series’ rebranding, an event topped by Caleb Plant’s 12-round win over Jose Uzcategui to win a 168-pound title in January. Dirrell was a former titlist at the time, regaining his hardware in a technical decision win over Avni Yildirim this past February in Minneapolis, Minn. In playing the FS1 main event, Dirrell switched roles with Plant, who joined the broadcast team for that bout. Sunday’s show in the D.C. suburbs features one televised bout in Hurd’s super welterweight division, but neither Cincinnati southpaw Jamontay Clark (13-1, 7KOs) nor Chicago’s Vernon Brown (10-0-1, 7KOs) anywhere near title consideration at this point. Peterson (35-4-1, 17KOs) is a former 140- and 147-pound titlist who will remain in the welterweight division, as will Lipinets (14-1, 10KOs) who briefly held a 140-pound title before moving up in weight last summer. Anthony Peterson, Lamont’s younger brother will appear in the co-feature versus former 130-pound title claimant Argenis Mendez. Their co-feature attraction will take place at super lightweight. Immediately after Sunday's show, Hurd (23-0, 16KOs) will resume training for the third defense of his super welterweight title reign. I wish pbc would go the hell away. [QUOTE=Oldskoolg;19609097]I wish PBC would hire Sean O’Grady. He was about the best damn commentator of the 90s. [/QUOTE]Hell yeah - Bob Papa calling the action and O'Grady doing the analysis. I wish PBC would hire Sean O’Grady. He was about the best damn commentator of the 90s.